Though L'amour braque is a 1985 gloss punk-style French action movie with the violent neon 1980s blue light of films of the era like Le Femme Nikita (with which it shares the amazing Tcheky Karyo) and Subway (1980), it's actually an art film, or a drug film, Brecht-fast style. Cheesy 80s synth stabs recall memories of Hong Kong action films with fractured English accidentally abstract-poetic subtitles. It's enough like a normal movie that without subtitles it would probably weird out a whole room of relatively un-intoxicated bros expecting Luc Besson-ish linearity in addition to Luc Besson-ish glamor. And action fans who wondered -- as I did -- if Karyo was just a dud actor with his stone-faced performance in Nikita can know for sure, as his character in Braque is wayyy out there. Not even the same guy! Like those Hong Kong fractured poetry subtitles ("I in the death you apple put"), somehow or other, as you're pulled along by the scruff of your neck if you don't think too closely, with no time to get your bearings, you join with easygoing Czech refugee Leon (Francis Huster) as he's spontaneously adopted by the drunken (one presumes he's on a legion of drugs throughout, but we never really see them. My professional guess: psilocybin) Mickey (Karyo) and his gang of laughing, joking, Shakespeare-quoting Arab terrorists. The beautiful Sophie Marceau shows up as his obsession, his life, yet another in Zulawski's string of love triangles, rich, super-smart, and out for a cryptic vengeance we only know about gradually, who proceeds to destroy Mickey and cockblock Leon while pursuing her ancient vengeance against a ritzy conglomerate. She uses Micky and his terrorist friends as dupes, man. Acting coy and lost and doomed so they fight over themselves to wipe out her enemies, and it's also about the friendship of two men. And it's about hope, and endurance, and cottonmouth. They chase and are chased and adore each other and then there's Leon's hot cousin Aglae (Christiane Jean, below) who competes for his attention while performing in a version of Chekhov's "The Seagull". Meanwhile, a strange cop follows the gang around, and in one sun-dappled grilling scene, notes that Mickey and company carry on with the "luxury of desperate gamblers", a telling phrase which I bothered to write down and thought a most clever title, because it describes most of the film -- indeed most of Zulawski's output based on what I've seen. At any rate, nearly any line I wrote down would have been a good title because, fractal-like, he packs the whole thing in every utterance. There's very little stopping to regroup or fortify positions here, the way someone on a manic high knows that if they stop to go to sleep or nurture negative thinking, their luck will change and their whole holy mindset will crash into nothingness and despair, so they keep on drinking, gambling and laughing like maniacs. Like Godard whom he clearly (and rightly) emulates, Zulawski throws you a new film language and expects you to hang on while he pulls you around by motorboat, and like Godard your enjoyment must depend on your ability to associate certain quotes, movements, and gestures with other films. 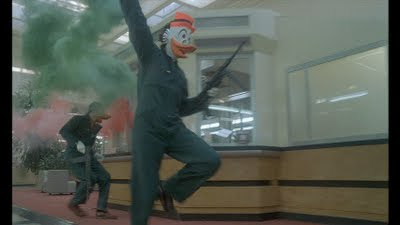 When you see the bank robbers in their Disney masks knocking off a bank in the opening sequence you might think of Kathryn Bigelow's Point Break (1991), but when you see them horsing through an impromptu number on their getaway route, they're like a dozen Harpo Marxes on a cocaine bender, or the Groucho-guerrillas in the films of Emir Kusturica. The bourgeoisie endure endless abuse without ever losing their nonchalance ala Bunuel. But these names just locate the onscreen insanity in some kind of loose contextual framework, because otherwise, goddamn it, this stuff is so fucked-up in its mad play on words-on-action genre and bourgeoisie art film expectation subversions that it can be hard to know where to set your bearings... I mean, unless you are first "experienced" or have spent time in a lunatic theater company, or seen a lot of Bergman movies about lunatic theater companies, or are on meds, a lot of meds. But, you would think that two hours of nearly nonstop shouting, kicking over vases, affronting the mores of capitalism and frothing at the succulently lipsticked mouth of Sophie Marceau would grate on your nerves, but Zulawski is such a master of pace and rhythm that he never gets you too worn out or cranky. And what works too is that though these guys are all insane -- and maybe this is just the French way -- all the passers-by and authority figures go along with their gags; everyone's got a sense of humor and when a crazy Marxist sticks a gun to your temple in Paris, it's considered declasse' to panic or plead. Guns inspire instant and sublime surrender, the magic key to the world. Cars get smashed and people run around throwing smoke bombs and breaking windows and all it gets from the gendarmes is that famous Parisian shrug. What ever happened to these kind of films? The most recent attempt at this kind of thing was, I'm afraid, Breakfast of Champions starring Bruce Willis. I'll stand by that film; it's balls to the wall, but of course when there's no wall it's hard to tell. One of my biggest regrets as an actor/filmmaker was in Queen of Disks (2007), when a viking woman stuck a knife to my throat as I was drinking coffee and I missed a chance to do a spit take; my innate decency and worry about spilling coffee on my ratty jeans stopped me from doing one and/or dropping the coffee cup, just letting go. You know how impossible those things can be to do intentionally? Like when someone pays you to pee in your pants, and you just can't do it, no matter how hard you try? These guys in this film? They don't have that problem; they crowd surf into total candy-coated confusion; they roll around on tables laden with food and the waiters don't bat an eyelash. They spazz out and sing at the top of their lungs while being chased by cops in riot gear and it would all just be posturing if Zulawski didn't capture a realistic sense of Parisian hustle and bustle like he's a freakin' Oscar-hungry auteur riche. When you're wading deep into a well-crafted, lit, Parisian street corner, man, you're into some spooky architecture, in front of which no amount of straightness can subdue. It all makes you realize that while someone like Godard's a great one for deconstructing genre, he's a bad one at capturing the momentum of genre itself -- poor Jean Pierre Leaud or Belmondo, for example, always seemed to carry an inherent decency that stops them from peeing on people's trousers or throwing grenades into dining rooms. If they did, Godard would quick cut to a picture of a comic book "Bang!" Ich liebe L'amor Braque.